Hardly a new field of research, social media is still an enigmatic research opportunity. While traditional academics are closing in with research (Khang et al. 2012; Runkehl 2012), often enough the traditional academic process can be seen as tedious and slow in this fast-changing topic. In my thesis I tried a more general approach and analysed whether digital communication on the social web still follows the core principles of established albeit dated communication models and whether these, consequently, can still be applied to the social web. This way, conclusions are more classic and not bound to cutting-edge research while still presenting usable results. I took on the models by Roman Jakobson and Gerhard Maletzke and applied them to blogs and social networks. My research was conducted on a qualitative level so the outcomes should be treated as a case-in-point. 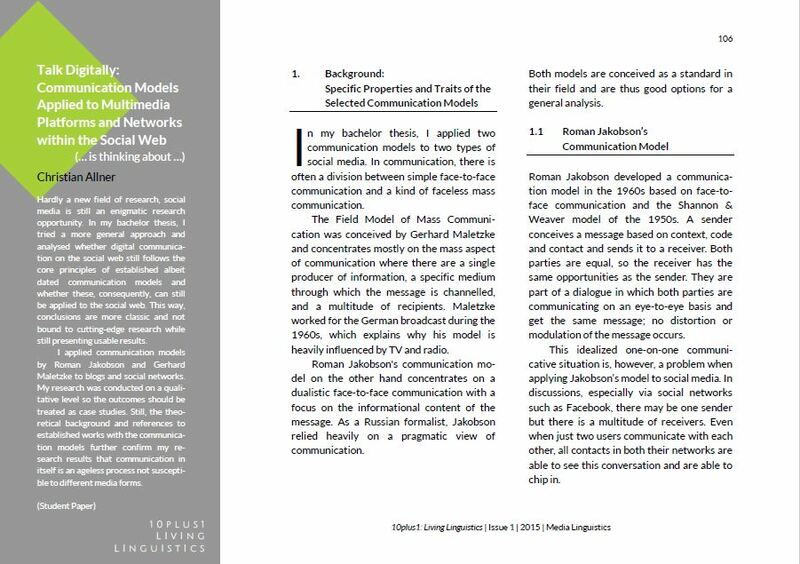 Still, the theoretical background and references to established works with the communication models further confirm my research results that communication in itself is an ageless process not susceptible to different media forms. Christian Allner, born 1988, B.A. ; a master student at the Martin Luther University Halle-Wittenberg („Berufsorientierte Linguistik im interkulturellen Kontext (BLIK)“) and a research assistant at the Seminar for Indo-European Studies and General Linguistics, both since 2014. A real-estate agent since 2010 and department vice-manager of a housing company up until 2011. Freelance since 2011 as Schrift-Architekt for small and medium-sized busisenesses in Germany regarding social media, seminars, and translations. Research fields: Social media, online marketing, online law, intercultural communication and linguistics. Focus on blogs and social networks, especially Facebook, Tumblr, and Pinterest.